Everything on this CD is receiving its first commercial recording. 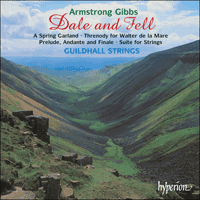 Armstrong Gibbs's most famous piece is the once very popular little orchestral movement called 'Dusk', which was recorded on our first 'British Light Music Classics' CD. Looking for suitable repertoire to introduce Guildhall Strings into the Hyperion catalogue we asked their programmer, Ben Buckton, to investigate Gibbs's other music. The composer's granddaughter, Anne Rust, told Ben that, for safekeeping, she had sent some scores many years ago to the Britten-Pears Music Library in Aldeburgh where they have remained untouched ever since. Ben's request for 'anything for strings' by Gibbs resulted in the production of a stack of dusty folders containing the handwritten manuscripts. The work on the top of the pile was the Threnody for Walter de la Mare, and it immediately became clear that the journey to Suffolk was going to lead to more than anyone had expected. This is attractive, well-written music in a lighter vein, dating from the first half of the century.